The smartwatch has yet to prove itself as a valid gaming platform; developers are trying some interesting ideas, but the watch still hasn't found its Angry Birds. Perhaps the best thing to do is go back to the start - all the way to 1972, the year that Atari launched Pong, to be precise. 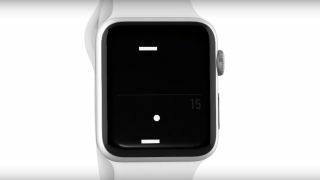 The original arcade game is now playable on the Apple Watch via the new app A Tiny Game of Pong. It's as pared-down and featureless as (some of) you remember, except this time the paddle is controlled using the Apple Watch's digital crown. Arcade mode is free, but you'll have to pay 79p (99 cents) for Classic mode, which throws you into a best-of-three match with the computer. Coughing up will also let you change the theme colour, for those of you who refuse to play games that don't coordinate with your choice of strap.